Last week Spice Islands emailed asking if I’d like to sample some of their spices. Hmm? I thought. Could I really use spices? Well, gee. I don’t know. And vanilla? What would I do with that? Just kidding, of course. What I said was “Heck yes!” So Spice Islands sent some spices and I told them I just *might* find somewhere to put them. As it happens, I’ve used everything above except the wasabi. I keep thinking I’m going to make some wasabi flavored brownies, but I haven’t felt like wasting the precious white powder in something uncertain when I know it can do its tasty sinus cleansing magic in so many savory dishes. So I made some brownies with everything they sent, except the vanilla bean and the wasabi – though I did throw in some cayenne and I do hope the wasabi’s feeling aren’t hurt about that. It’s just that I know and trust cayenne (and chipotle) with chocolate and wasabi is more of a sushi or turkey sandwich type thing. Sorry, Wasabi. Anyhow, I was impressed with the spices and not just because I’d gotten them for free. I’d been buying spices out of the bulk bin (a real bargain), but these tasted fresher. They probably ground them fresh at the factory just for me, no? I also liked the vanilla, which frankly, I did not know Spice Islands even made until they told me. It was light and flavorful, and Spice Islands is proud of the fact it doesn’t have corn syrup in it. I didn’t know other vanilla did. The recipe is actually from Spice Islands, but I halved it and added cayenne so I’ve re-typed it. I made it in a 9 inch square metal pan, but the full recipe is made in a big old 15×10 inch pan similar to what you’d use for a Texas Sheet Cake. But the Aztec Brownies were more interested than good old TSC. They were lightly spiced, not overly sweet (thank goodness) and were tight crumbed and fairly dense, even though they were of the soft and cakey variety. Overall, an excellent recipe. They were so easy to make that maybe I will try again with the wasabi. Maybe. Preheat oven to 350º F. Grease a 9 inch square pan or line it with non-stick foil. Combine flour and sugars in a large mixing bowl. Set aside. Bring cocoa, butter and water to a boil in a small saucepan. Pour hot mixture over flour and sugar; stir to mix thoroughly. Mix buttermilk, egg, baking soda, spices and extracts in a smaller bowl. Add to chocolate batter and mix well. Pour into a greased 9 inch square metal pan, and bake for 20 to 25 minutes or until wooden pick inserted in center comes out clean. Combine butter, buttermilk and cocoa in a medium saucepan; bring to a boil. Remove from heat and gradually stir in powdered sugar and extracts. Beat until smooth and spread over hot brownies. Sprinkle almonds evenly over top of icing. Your recipe looks delicious – I’ll have to try it! As for Spice Islands: I just bought their vanilla for the first time, and used it in one batch of cookies, the day after using store brand in a batch of the same cookies (my coworkers wanted more), and let me tell you, that stuff is awesome. The cookies were noticeably more delicious with Spice Islands vanilla, with every other ingredient being the same. I need to try their other spices. I buy these spices at my local Kroger store and I really like them a lot too. very reasonable price & good variety. 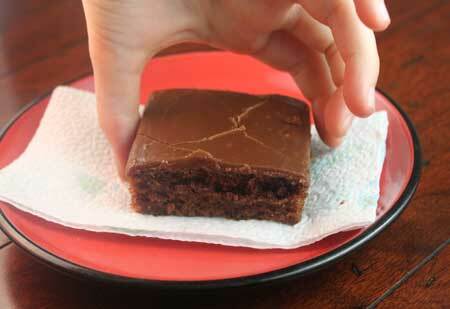 your brownies look great. Joe, thanks! Lee, one reason I recommend buying a scale is because there’s a difference in volume and weight. 1 cup is 8 fluid oz, but the weight of what you put into that cup varies. For instance, 1 cup of popcorn would be 8 fluid oz of popcorn, but would weigh less than 1 oz. For measuring flour, having a weight measurement is helpful because 1 cup of flour can weigh anywhere from 4 oz to 6 oz depending on how heavy-handed a person is with a scoop. So having an exact weight helps ensure accuracy. Grams are even more accurate than oz, but I’m in the habit of using weight oz. Lee – 4.5 ounces is about 127 grams. That is indeed 1 cup of flour (measured using the spoon/sweep method). you have 1 cup down as 4.5???????????? 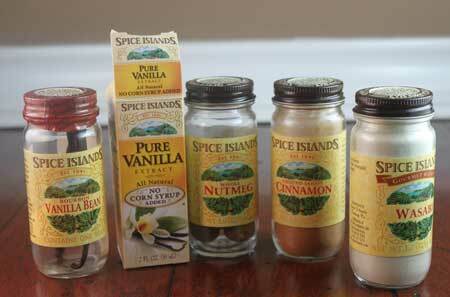 These sound great and I have appreciated Spice Island products for a long time, just have to lower my cost sometimes. Thanks for sharing! This looks very similar to Texas sheet cake, but with a spice upgrade. 🙂 Maybe if I send Spice Island photos of my two cabinets full of spices they’ll send me a huge box of replacements. I date everything when I open it so I know when I need new stuff. Nice…I like the addition of cayenne, Anna. I have switched completely over to vanilla bean paste now. I love the cute way you wrote this post. So did the original Spice Islands recipe call for wasabi in the brownies? Wasabi is fantastic in mashed ‘taters! Your brownies look delectable! I recently tried the wasabi Kit Kat in Tokyo. Pale green in color, white chocolate with a slight wasabi kick. The brownies look great! I recently purchased wasabi Kit Kat in Japan. Green in color, white chocolate with a slight wasabi kick. Those look fabulous–I wish I had bulk spice bins at my grocery stores, but I will put this brand’s recipe on my ‘must try’ list. The top of the brownie looks particularly beautiful! D, thanks for the link to your blog. I’ll have to try your recipe too. Cindy, thank! I just added it in. As for comparisons, Spice Islands is great because you can pick it up at most grocery stores and don’t have to wait for it to arrive in the mail. Sue, that’s what I thought at first, but the texture is lighter and softer. These look great! The appearance of the brownie and frosting make me think of your Frosted Fudge Brownies. Wish I had seen this earlier today. I might have whipped some together and then taken them to share with the cyclists tonight. I don’t see the cayenne amount… How do Spice Island spices compare to Penzey’s or King Arthur? These remind me of the chipotle brownies I made back when I first started blogging (http://yellebellyboo.blogspot.com/2010/05/bizcocho-de-chocolate-y-chipotle-and.html) except they used chocolate instead of cocoa. I really need to try that recipe again…or maybe try yours! I love a hot spice in brownies, it’s truly unique.